personnel de 4 sur la propriété disponible pour fournir un cocktail de bienvenue quand vous arrivez, aider avec des bagages, fournir des suggestions d'excursions et répondre à vos questions. Le restaurant descend le déjeuner et le dîner sur réservation. Property very clean. Staff very friendly and over accommodating! Family went on fishing trip and Jeff recommended we have Isis and his staff cook our fish for us. So glad we did it was Amazing! Best dinner on island entire stay!! I could go on and on about this place and the staff. Highly recommend. 5 stars in every way ❤️🏖�. Thanks again Jeff and staff! We loved our bungalow over the water and enjoyed a relaxing 4 days! 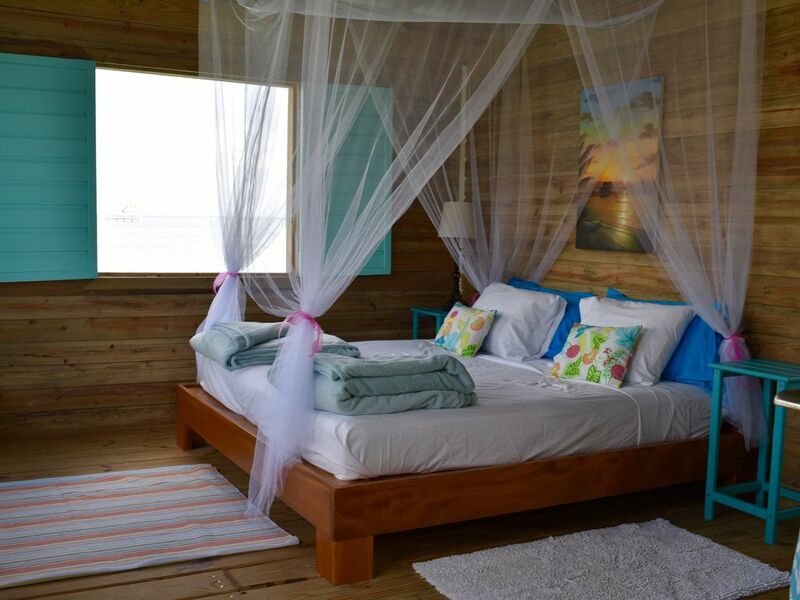 The bed was very comfortable and the breeze off the water kept the room the perfect temperature. We loved hearing the water at night! It's a bit out of town but not too far. The staff were also great, available if we needed anything. The restaurant had basic but yummy food and they were very accommodating. We feel so blessed to have stayed at your property Jeff. Henry, Isis, et.al. could not have been more accommodating and helpful. Their hospitality was unmatched. Casa del Mar was exactly what my husband and I were hoping for and the whole set-up definitely exceeded our expectations. Calm, quiet & peaceful. I haven't slept that well in ages which I will attribute to the comfortable bed, sounds of the ocean and the constant trade winds blowing through. I cannot wait to come back and stay again - I wish I was back already because it's cold in Wisconsin!!! Thank you for sharing your paradise with us! Belize definitely stole a piece of our hearts. And please let Henry & Isis (and all) know how much we appreciated them and their kindness. As many reviews stated, the pictures do not do this place justice!!! It's just incredibly beautiful!!! Henry and the other staff were very kind!! We are headed into downtown san pedro for the rest of our trip, I wish we stayed here longer!!!! Thank you all so much I really hope to make it back here again!! We had a fantastic few days of our honeymoon, thanks so much!! The quiet, peace, privacy, and connection with the sea and nature was unparalleled at Casa Del Mar. It was truly an exceptional retreat off the beaten path and I was so happy to either return there after a busy day or never leave! The stinky seaweed was indeed present throughout my stay but use of the the lovely private pool at the big house to cool off was a great substitute for a swim in the ocean. I also took a wonderful day long snorkeling tour with Amigos Del Mar which I highly recommend if you want to be guided to the best snorkel spots around Ambergris Caye and Caye Caulker. Also, I regretted my very bumpy golf cart ride to Secret Beach which is NO secret! It's just a short stretch of very commercialized beach with loud music and wall to wall people. The property at Cas Del Mar is WAY more peaceful and truly secret. Also can't say enough about the hospitality of Isis, Henry, Julia and the other woman whose name I am forgetting. They were perfect hosts and catered to our every need. All in all, had a wonderful stay at Casa Del Mar and will for sure be returning. Cute little dock house. Couldn't bring myself to spend over $250USD for the resorts. This more "budget" accommodation was perfect. I loved hearing the waves lap up against the pillings. The breeze out on the dock kept the mosquitoes away (of which there are a lot of around once the sun goes down). The house was well appointed. The shower is on shore with a fence around but otherwise is open, which feels a bit exposed initially, but you get used to it. The toilet and shower on shore is a minor inconvenience. There is running water and drinking water in the unit. The chatχll restaurant grounds are meticulously groomed and very pleasant. We never had a chance to go to the restaurant as the hours are limited and we were always out exploring. The road is very bumpy which gets annoying with touring around but it is also part of the fun. Would recommend staying here.